Родился в Лондоне, Англия, Великобритания. opposite Miriam Hopkins in Becky Sharp (1935). Otherwise, Mowbray was hown to best advantage in his many "pompous blowhard" roles, and in his frequent appearances as the "surprise" killer in murder mysteries (Charlie Chan in London, The Case Against Mrs. Ames, Abbott and Costello Meet the Killer: Boris Karloff, and so many others). In his off hours, Mowbray was a member of several acting fraternities, and also of the Royal Geographic Society. 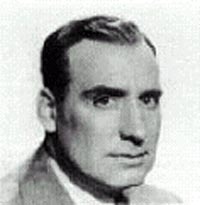 One of Alan Mowbray's favorite roles was as the softhearted con man protagonist in the TV series Colonel Humphrey Flack, which ran on the Dumont network in 1953, then as a syndicated series in 1958. ~ Hal Erickson, All Movie Guide. Внимание: если Вы заметили какие-нибудь неточности или у Вас есть какие-либо дополнения об актере - Алан Моубрэй - то вам сюда.